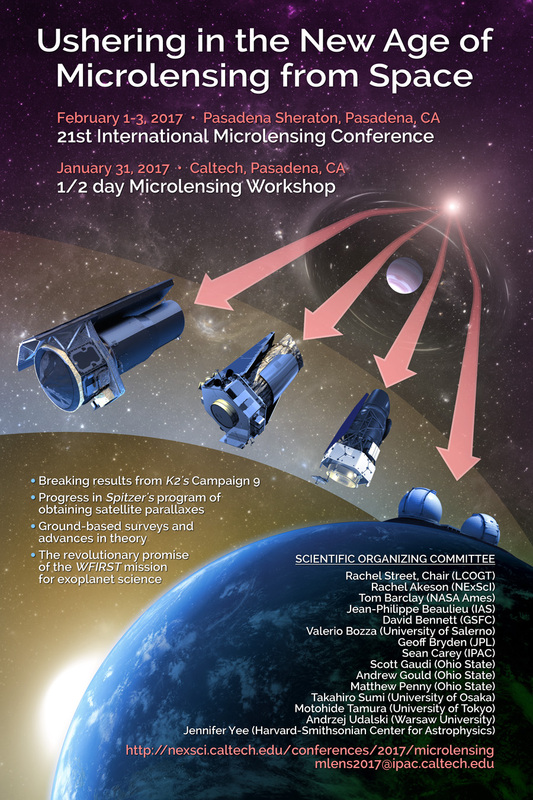 We happily invite the exoplanet community to the 21st International Microlensing Conference entitled "Ushering in the New Age of Microlensing from Space." The field of gravitational microlensing is burgeoning, in particular due to the success of several space-based missions. We will highlight breaking results from K2's Campaign 9 (K2C9), a combined ground- and space-based microlensing survey, as well as progress in Spitzer's program of obtaining "satellite parallaxes." Talks on ground-based surveys and advances in theory will also be featured prominently. Finally, we will have a number of talks on the revolutionary promise of the WFIRST mission for exoplanet science, which was recently approved to enter Phase A. Together these endeavors provide invaluable insight into topics such as the Galactic distribution of exoplanets, the abundance of free-floating planets, and the demographics of cold exoplanets. The three-day conference will be preceded by a free half-day tutorial on the Caltech campus featuring a series of microlensing talks introducing the mathematical formalism, observational methodology, and recent results of gravitational microlensing searches for exoplanets. Special emphasis will be given to the demographic questions addressed by space satellite programs, including Spitzer, K2C9, and WFIRST. This tutorial is recommended for those new to the field of microlensing and will help set the stage for synthesizing the content of the remainder of the conference. We thus encourage anyone interested in the microlensing technique to join us on the afternoon of January 31, 2017 for this free session, regardless of planned conference attendance. Sally Dodson-Robinson (Univ. of Delaware): How Can Microlensing Observations Inform Theories of Planet Formation? February 1-3, 2017: 21st International Conference on Microlensing at the Pasadena Sheraton with conference dinner at 7 pm on Thursday, February 2. The registration fee includes the opening reception on Tuesday evening, coffee breaks and light breakfast during the conference. The conference dinner will be held Thursday evening, Feb. 2 at Porto Alegre Brazilian Churrascaria. The dinner costs $65 and is not included in the registration fee. Diners will enjoy a large selection of roasted meats carved at your table along with a variety of hot side dishes and a large salad bar. There are plenty of delicious vegetarian options at the side dish and salad buffets. Dinner includes non-alcoholic drinks and a cash bar will be available. Porto Alegre is within easy walking distance of the conference venue, the Pasadena Sheraton. Click here to register for the ½- day microlensing tutorial at Caltech, the conference, and to purchase the conference dinner. The conference will be held at the Pasadena Sheraton located in the heart of Pasadena within easy walking distance to many shops and restaurants. We have reserved a sleeping room block at prevailing government rate ($175 for February FY 2017). Click here to make your hotel reservation by the January 6 deadline.